Consumer Reports Tastes & Rates Celebrity Chef Food Products | Whose Soup, Sauce & Dressing is the Best? When shopping for those celebrity chef-endorsed foods, it's extremely common to see increased prices due to the name association, plus the assumption that a professional chef would create a superior recipe. But are these products really worth their price tag? 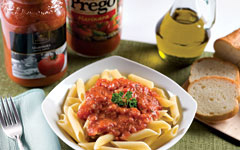 Consumer Reports recently tested celebrity chef pasta sauces, soups, and salad dressings against other popular brand names and grocery store generic brands. According to CR's Kim Klemen, "about half of the celebrity products were no better than cheaper mainstream brands." Mario Batali and Giada De Laurentiis both earned high ratings for their marinara and tomato basil sauces, respectively. De Laurentiis' tomato basil sauce was also awarded as a Best Buy, retailing $5 less than Batali's sauce. However, sauces from Emeril Lagasse and Newman's Own didn't rank so high. Klemen pointed out that they didn't fare any better than the less expensive Ragu pasta sauce. Their reason? All three products list tomato puree as the first and primary ingredient (tomato paste mixed with water). Celebrity chef canned soup products didn't make the cut, save for Wolfgang Puck's tomato basil bisque -- not too shabby from someone with the title of Wealthiest Celebrity Chef. Interestingly, Consumer Reports didn't find any salad dressing products that stood out from their less expensive competitors. Klemen recommended making simple salad dressings from home with fresher, healthier ingredients instead. Jamie Oliver’s Pasta Sauce: Saltier Than Seawater?